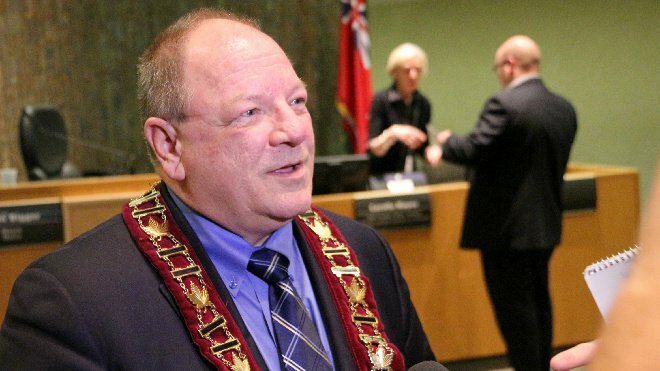 Greater Sudbury Mayor Brian Bigger addresses reporters Thursday after city council approved the $512 million city budget that froze taxes without cutting services or laying off staff. Photo by Darren MacDonald. It will be a tall mountain to climb next year, but city council unanimously passed its $514 million budget Thursday that froze taxes while still including funding for key projects. Council achieved the freeze by eliminating about $2.5 million in planned capital spending, used more than $500,000 from unspent HCI funds and drew millions from reserve funds. In total, $6 million will have to be replenished over the next year, and staff were given the task of finding that money through savings in employee attrition, increases in revenue from user fees and increasing the money the city gets from advertising revenue. But Mayor Brian Bigger was able to keep his campaign pledge to freeze taxes without reductions in service levels or laying off staff. He praised staff and all 12 councillors for their work in achieving the freeze, saying it was the definition of a team effort. “The most impressive thing is we saw valuable input from right around the council table,” Bigger said. “Each councillor contributed in their own way. Budget chair Mike Jakubo was singled out for praise by Bigger, as was Chief Financial Officer Lorella Hayes. For his part, Jakubo said next year will be a challenge, but he was satisfied with what they have accomplished so far. City CAO Doug Nadorozny praised councillors for getting through what he called one of the more complex budget processes in the city's history.